Hold onto your handle bars, the Harcourt Mountain Bike Trails at La Larr Ba Gauwa Park are ready to ride! The January video update from DELWP shows some of the family friendly aspects of the new trails project, including Russell’s neat flowery bike basket. 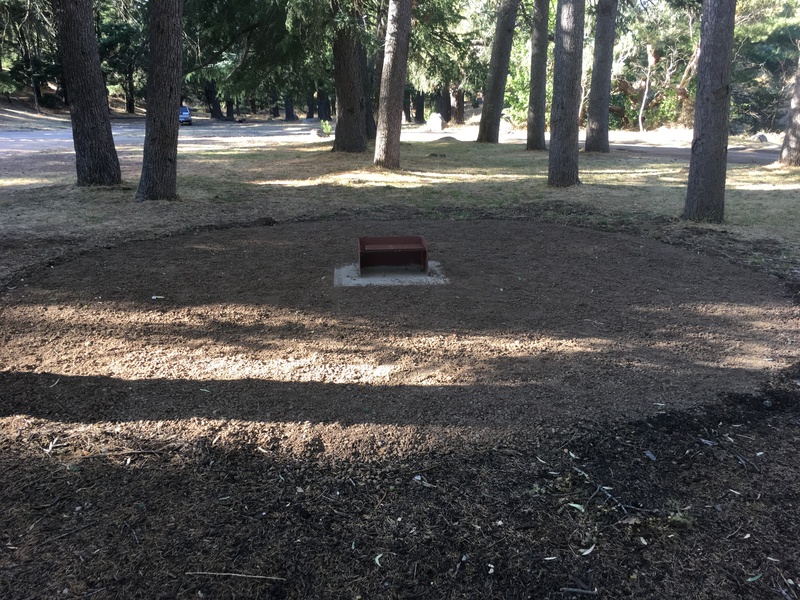 The February update from the Department of Environment, Land, Water and Planning includes a progress photo of the shelter at the park, and news about the off-road pathway connecting La Larr Ba Gauwa to Harcourt—made possible by a contribution from Harcourt Progress. It also mentions wayfinding signage and the appointment of a Committee of Management. Read the February report from DELWP. A community update from early January 2018 confirms the name and branding of the park, with the title of the document referring to it as the La Larr Ba Gauwa Harcourt Mountain Bike Trails. Pronunciation of La Larr Ba Gauwa is explained, simply, as Lah Larr Ba Gower. The update details the finishing touches to be done over the next couple of months to get the trails ride-ready, including the pathway connecting the park to Harcourt’s village centre. Read the January report from DELWP. An earlier update is from 19 December 2017 shows things are approaching completion. Dirt Art have mostly finished the trails, with only minor surfacing and signage to go in January. The video update also includes vision of Project Manager Manning taking on the biggest slope he’s dared yet. Back on 5 December, Mr Manning showed us the view from the Southern Knoll, the progress of advanced trails, the construction of toilets, the park entrance, and the path that connects it to Harcourt village. On 5 November, Russel displayed his mad open-mouthed riding skills. The official written report from Department of Environment, Land, Water & Planning (DELWP) dated 23 October 2017 had juicy details about construction progress, as well as stuff about naming it ‘La Larr Ba Gauwa Park’, and a proposal for the at-that-time unnamed road that runs to it. An earlier construction news update from 11 October 2017 might also be of interest. Below, we’ve saved earlier updates from The Department of Environment, Land, Water & Planning, including progress videos and records of the earlier timeline for consultation and construction. Situated next to Mount Alexander Regional Park, the Harcourt mountain bike park will provide up to 34 kilometres of dedicated mountain bike trails and magnificent views alongside a natural forest setting. The project is estimated to inject $9.8 million into the local economy, attracting 100,000 visitors each year and generate local jobs. Built to International Mountain Bicycling Association standards, the park will be consistent with future development plans for the Harcourt area while improving the site’s environmental value. The site of the mountain bike park is on the old plantation site on the west side of Mount Alexander. The majority of the car parking is planned to be catered for in the Harcourt township and riders will be encouraged to support local businesses and take the short ride to the trail head on the mountain. There will also be limited parking provided at the mountain bike park. The Victorian Government is not purchasing private land to build a car park. The park will not be fenced and will be open to all recreational users including walkers and horse riders. The community will also notice that works will begin soon to upgrade the fire access track. On 13 January 2017, the Community Reference Group and the Project Control Group visited the Forrest Mountain Bike Trails, touted to be one of the premier mountain bike destinations in Victoria, to learn about the successes and challenges of building a world class mountain bike park. The town has significantly benefitted economically and socially since the mountain bike park was built approximately 10 years ago. Also of note, was that mountain bike riders are very willing to ride the three kilometres from town to the trail head. This is approximately the same distance from the Harcourt township to the proposed trail head of the Harcourt mountain bike park. DELWP and its partners held a Community Information Session on 8 February 2017 at the Harcourt Leisure Centre. More than 40 community members attended the event. It was an importante opportunity for community members to ask questions and give their feedback on the early stages of the project. Community members are excited about the project and are expressing their support for the many expected benefits. Many residents told us that they supported the project and look forward to its economic benefits to the Harcourt community. There is strong support to retain access to ‘The Oaks’ and for the park to be available to a range of existing compatible recreational users. There was also a number of people concerned about ensuring safe rider access to and from the mountain. DELWP and Mount Alexander Shire staff are working together to review various options before discussing with the community a preferred route. Russell Manning, Project Manager for the Harcourt mountain bike park, has also met and will continue to meet with interested people to gather ideas, listen to opinions, provide progress updates and discuss this exciting project. The next opportunity to have your say, get more information or ask questions about the project will be at the 2017 Harcourt Applefest on 11 March in Harcourt. Look out for the Harcourt Mountain Bike Park stall and be ready to share your ideas. Please contact Russell Manning at 5430 4444 or harcourtmbp@delwp.vic.gov.au for more information or any enquiries on the project. April: Contractor appointed. Preliminary design out for public comment and community consultation. May: Community feedback included in final trail design. Trail design completed and submitted for Federal and State environmental planning approvals. June: Federal and State environmental planning approvals underway. July: Trail design approved. Construction begins, weather permitting. August-November: Construction to be undertaken and completed. Community members are encouraged to register their interest to receive project updates and become involved in future consultation and engagement opportunities. Register your interest at harcourtmbp@delwp.vic.gov.au or call DELWP on 136 186.